I am not a trained teacher. Will I cope? The home school courses contain specific guidance on what and how to teach. They have been written especially for parents, like yourself, who may not have any teaching qualifications or previous teaching experience. Additional support is provided by a personal tutor who will advise and encourage you in your role as teacher. and will also help to ensure that your child is working at the required standard. WES tutors are well-qualified and experienced teachers. A number of them have lived and worked overseas and, as a result, have first-hand knowledge of the issues that you may encounter if you are following our courses outside the UK. Your tutor will work with you from enrolment and will soon become a valued contact for both you and your children. Many families have worked with the same tutors for a number of years and build up close relationships with them. Will my child miss out on the social aspect of school? In the overseas setting, it is very rare for families to be completely isolated and often you will find yourself living within the local community. There should, therefore, be occasions for your child to socialise. It may also be possible for your child to attend a local school, using home school to supplement areas of the curriculum as necessary. Rather than being seen as a cause for concern, the benefits of experiencing another culture can afford your child positive social opportunities to which he or she would otherwise not be exposed. In the UK setting, where home schooling is becoming more popular, you may well find other families with whom you can meet and exchange ideas. There may also be a number of after school clubs or weekend and holiday activity groups that your child can join. Do courses follow the National Curriculum? Yes. Since the 1988 Education Reform Act, WES has developed its curriculum in line with the National Curriculum of England and updates its materials on a regular basis. Will my child fit back easily into school? As the WES home school courses follow the requirements of the National Curriculum of England, your child should not have a problem fitting in academically. In fact, because of the one-to-one teaching which allows more to be covered with fewer distractions, we find that children are often in advance of their peers. At the end of your enrolment with WES, your tutor will provide a final report on your child’s educational achievements to give to the new school. This should ensure a smooth transition from home school to mainstream education. Your child will also receive a Certificate of Completion in recognition of their time with WES. How do I know that my child is keeping up with his peers? All WES courses are written for specific age groups, from 3 years through to 14 years of age. 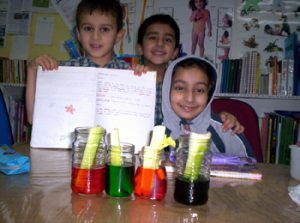 Clear objectives which your child should reach by the end of each year are set out for English, Mathematics and Science. You will be asked to send in reports and work samples on a regular basis, to enable your tutor to assess your child’s progress and ensure that he/she is working at the appropriate level. What about the lack of competition? Children are helped to take responsibility for their own learning by following their progress and improving on performance. 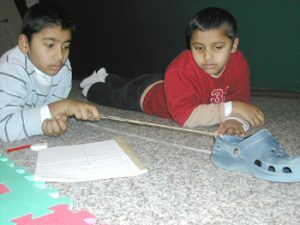 The depth involved in the one-to-one teaching situation offers intellectual challenge and stimulation. Finally, home school children also benefit from co-operative learning as all the family become involved in the educational process. What about books and materials? WES will supply you with all the necessary books you will need to enable you to follow the curriculum. These books are continually updated and reflect the best that is available in terms of content, interest, appeal and clarity. In addition, kits to complement the Mathematics and Science courses are available. These kits are put together in-house and include all specialist items that you will need. Do I have to fit in with school terms? No, you can begin at any time of the year, whenever is most convenient for you. When you do begin, we suggest that you divide the year into three terms of approximately 12 weeks each. Home schooling allows for greater flexibility as, although a timetable is suggested, this can be re-organised to suit your individual requirements. There will also be plenty of time for you to fit in extra-curricular activities. What if my child is ahead of his age group? WES is able to match the course to suit the individual requirements of each child. This enables children to work according to their ability, whether they are in advance of their peers or behind. In addition, the teacher will need to set aside time for record keeping, marking and display. The student will also be expected to do approximately 1 hour per day of independent work (homework) in Key Stage 3.